Across the country, schools are using a ‘free’ app that is harvesting personal information about their students and the vast majority of parents have zero clue about it. Not only is this ‘free’ app gathering personally identifiable information (PII) on students, it’s also collecting private information on their parents, friends, and family. What is this ‘free’ app? It’s Google’s “G Suite for Education.” Michelle Malkin has just written about this topic – and parents, it is a MUST READ. So is this one at Missouri Education Watchdog about your data, being shared without organizations without your consent all over the world. "Parents, did you get notice before your child signed on to a Google account?" Unlike some parents, I was aware of the existence of this “G suite” app. Yet my prior knowledge of it did nothing to protect our family from being pulled into it, as I found out just yesterday evening at the open house at my child’s school. During the open house, one teacher presenting to the parents gathered there mentioned that students can access all their lessons through the “website” and their assigned Gmail accounts. Assigned Gmail accounts?? Wait, what? I wasn’t asked permission for this nor was I even TOLD about this. Bear in mind, Google has been sued multiple times over their collection of student data. Parents and Watchdog groups file a complaint with the Federal Trade Commission that Google is violating laws that protect children by collecting student data and then advertising to kids under the age of 13. The suit wants Google to disclose more details about G Suite for Education in use by the over 250,000 K-12 students in Mississippi. “Through this lawsuit, we want to know the extent of Google’s data mining and marketing of student information to third parties. I don’t think there could be any motivation other than greed for a company to deliberately keep secret how it collects and uses student information,” said AG Hood in a statement. 2015 – A complaint is filed by EFF with the FTC accusing Google of data mining students through their Ed offerings like G-suite and of violating the Student Privacy Pledge. 2014 – A class action lawsuit is brought against Google and while the complaint was ultimately dismissed, Google admitted that they had been “‘scanning an indexing emails” of students. And just last month, it was reported that Google was partnering with the US Dept. of Education. Related leaked video from Google from 2016 confirms the company’s intent to push Chromebooks and data mine students. Google’s CEO Sundar Pichai replied that Google will cement the reach of their “educational products” to “segments of the population [they] are not [currently] fully reaching.” How are they doing that? Obviously, G Suite. Going as far back as 2012, I’ve been writing about the increasing data collection on students in North Carolina. Initially, I explored the State Wide Longitudinal Database System (SLDS) which is called CEDARS in North Carolina. The SLDS in NC, like nearly every single state who adopted Common Core, was built with incentives from the Race To The Top grant. In fact, building an SLDS was part and parcel of adopting Common Core. In my investigation of CEDARS, I found that a main importing source for CEDARS is the former Pearson Education application called PowerSchool. Data was being ported into the CEDARS system from a variety of sources. Everything from discipline reports to free and reduced lunch information was going into this database. I wanted to know what was in there about my kid so I started on an over year-long journey of meetings and public records requests that ultimately I had to get a lawyer involved in just to get my kid’s data. After a long and drawn out process, I was finally was given a watered down version of my child’s record and I learned a terrifying fact: CEDARS cannot be edited. That means what goes in there about your kid, correct or incorrect, stays in there. The most disturbing part was that I discovered CEDARS is not accessible by parents. A parent being unable to access their own child’s data is a blatant violation of the Family Educational Rights and Privacy Act of 1974 (FERPA). To this day, no legislator, educrat, or administrator has ever attempted to address or correct this despite my multiple and loud protestations. Malkin’s article I mentioned above also touches on the data mining of our babies in Kindergarten and the use of the uber intrusive software package, TS Gold. If you have a kid in Kindergarten right now or have had one go through any time in the last four years in North Carolina, they were subjected to the Kindergarten Entry Assessment (KEA). The KEA utilizes TS Gold to capture the ‘data’. By data, I mean written notes, assessments, and even photos and video of your child completing tasks in the classroom. The data collected by TS Gold is merged into CEDARS, where it will follow your child through college and, thanks to the NC legislature, into the workplace. What exactly is this monster collecting on your 5-year-old? Simply put – everything. Below is a bullet point summary of the KEA that I and colleagues in North Carolina put together. Click the link about the “Five Domains” for more details. At the bottom of this article is a treasure trove of related articles and documentation related to the KEA. The KEA was piloted in 79 schools from September to October 2014. 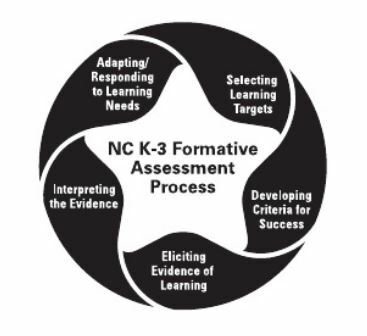 The KEA is the initial benchmark of all K-3 Assessments. It is aligned to Common Core. The KEA is tied to the Fed-Ed Race To The Top – Early Learning Challenge (RTT-ELC) grant. View the North Carolina RTT-ELC application here. The same cast of characters that funded, pushed and promoted Common Core are behind this early learning collaborative, including the Bill and Melinda Gates Foundation. It generates a Child Profile, completed within 60 days of entry, addresses requirements for screening five domains, and satisfies data requirements for the RTTT Early Learning Challenge grant. The KEA assessment is part of an “on-going,” set of assessments beginning at age 5. Related assessments continue through 3rd grade in NC. Under the five domains, each child is profiled on 8 constructs. (There are a total of 15 constructs to be developed by 3rd grade). Two of the constructs (Letter Naming, Book Orientation & Print Awareness) can be satisfied with another assessment (mClass: Reading 3D) already being used in Kindergarten. The data is electronically transferable to the KEA from the other assessments. Teachers profile each child on each of the 8 constructs; verification of child’s performance could include teacher notes, demonstration of worksheets, photos, and videos. Data collected from students is currently being housed at UNC-Charlotte. At some point, data will be included in the Statewide Longitudinal Data System/CEDARS. There is no scoring system, no grading system, nor a report of any kind that parents receive about their child’s KEA performance. Roll out for every kindergarten class (120,000 students) in Fall 2015. Full implementation by 2016-17. Parents are sent a brief notification that their child will be participating. There is no opt-out option provided. This information is often one-page flier that lacks details about the data collection and subjectivity of the domains being assessed. Parents CAN opt out of the data collection, but they must do it in writing to their specific school. This entry was posted in Big Ed Complex, EDUCATION, LL1885, Parental Rights and tagged Data Mining, G Suite, Google.. Bookmark the permalink.